The wedding cake has long been a symbolic detail—the tradition of breaking the cake over the bride’s head dates back to the Ancient Romans. Customs evolve with the times, of course, and today the ceremonial cutting of the wedding cake has remained a popular and meaningful wedding reception activity. It provides both a fabulous photo opportunity and symbolizes the couple’s first joint task as newlyweds. Even if you think you’re a pro at cutting sweets—at birthday parties or entertaining—check with your cake baker or caterer for special instructions to make the first cut. You wouldn’t want to place the knife in the wrong spot and cause the delicate tower to topple over. Your baker will often recommend you cut from the bottom tier. This might sound obvious, but remember to use the knife, not the server, for the quickest and cleanest cut. (The slice can be modest since you really only need two bites’ worth.) Slide the slice onto the server, then place it on a plate. Use the knife to cut the slice into two small pieces. You can each take your pieces from the same plate for the ceremonial feeding. 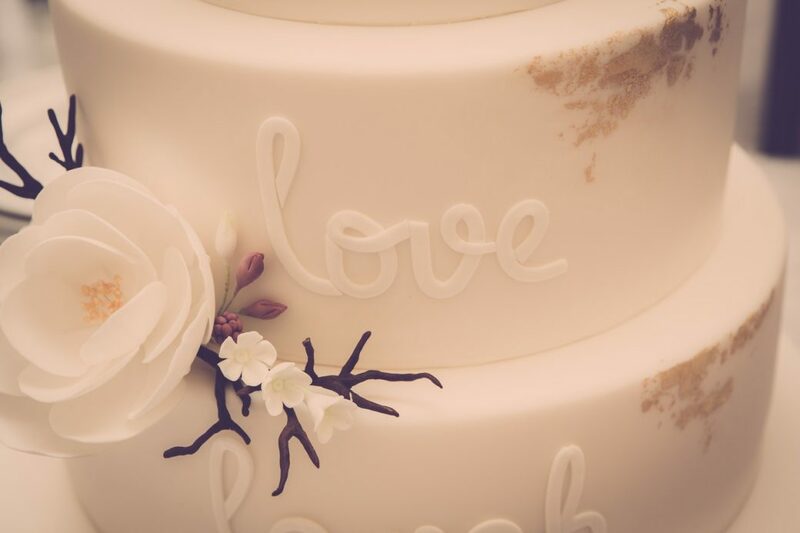 Once the initial piece is cut, the newlyweds usually feed each other the first slice, symbolizing their commitment to provide for one another. In some cases, this moment is replaced by a different tradition: smashing cake into each other’s faces. How you feed each other the cake is up to you, but remember—you don’t need to smear frosting on your new spouse simply because you think your guests expect it. You just had your hair and makeup done and you’re probably both in pricey outfits—don’t risk any staining if you don’t want to. Either way, ask your baker or caterer to have napkins (or even a warm, damp cloth) nearby to wipe up any rogue crumbs and frosting quickly. The cake cutting is often one of wedding photographers’ favorite images to capture. Before the celebration, be clear and specific with them about your shot list. Do you want the traditional posed shot of the two of you cutting the cake together, or do you prefer a more candid, documentary-style one? Is a close-up of your hands on the knife important, or are you only interested in the big picture? Nailing down these must-have photos will steer your pro in the right direction so you can be totally in the moment instead of worrying about whether or not they’re capturing the right shots. Once you’ve cut the cake, the catering staff will take over and often bring it back into the kitchen to slice for the rest of your guests. Couples used to freeze the top tier of their wedding cake for the baby christening that was expected to follow soon after. Today, many still opt to save a tier or even a few slices to enjoy on their first anniversary, Valentine’s Day or New Year’s Eve together. In the past, couples actually sent their guests home with cake, or sent pieces to those unable to attend. While this tradition isn’t as common anymore—replaced by separate favors—it’s still a nice gesture (and a great way to avoid wasting cake) to offer boxed slices for guests at the end of the evening as a sweet takeaway.